Genocide never just happens. There is always a set of circumstances which occur or which are created to build the climate in which genocide can take place. Gregory H Stanton, President of Genocide Watch developed the 10 stages of genocide which explains the different stages which lead to genocide. At each of the earlier stages there is an opportunity for members of the community or the International Community to halt the stages and stop genocide before it happens. 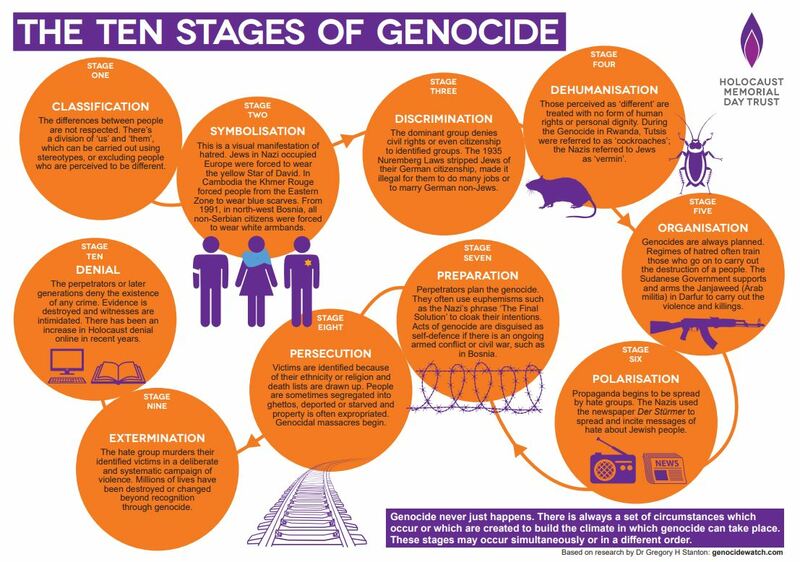 Click here to download a PDF copy of the ten stages of genocide poster. Classification - The differences between people are not respected. There’s a division of ‘us’ and ‘them’ which can be carried out using stereotypes, or excluding people who are perceived to be different. Symbolisation - This is a visual manifestation of hatred. Jews in Nazi Europe were forced to wear yellow stars to show that they were ‘different’. Discrimination - The dominant group denies civil rights or even citizenship to identified groups. The 1935 Nuremberg Laws stripped Jews of their German citizenship, made it illegal for them to do many jobs or to marry German non-Jews. Dehumanisation - Those perceived as ‘different’ are treated with no form of human rights or personal dignity. During the Genocide in Rwanda, Tutsis were referred to as ‘cockroaches’; the Nazis referred to Jews as ‘vermin’. Organisation - Genocides are always planned. Regimes of hatred often train those who go on to carry out the destruction of a people. Polarisation - Propaganda begins to be spread by hate groups. The Nazis used the newspaper Der Stürmer to spread and incite messages of hate about Jewish people. Preparation - Perpetrators plan the genocide. They often use euphemisms such as the Nazis' phrase 'The Final Solution' to cloak their intentions. They create fear of the victim group, building up armies and weapons. Persecution - Victims are identified because of their ethnicity or religion and death lists are drawn up. People are sometimes segregated into ghettos, deported or starved and property is often expropriated. Genocidal massacres begin. Extermination - The hate group murders their identified victims in a deliberate and systematic campaign of violence. Millions of lives have been destroyed or changed beyond recognition through genocide. Denial - The perpetrators or later generations deny the existence of any crime.